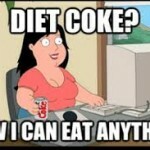 Does Diet Coke Really Make You Skinny? March 24, 2013 / Debbie / Comments Off on Does Diet Coke Really Make You Skinny? Who hasn’t seen Cindy Crawford or Beyonce hawking the Diet Sodas? Or the thin, happy woman who has a fridge full of artificially flavored diet yogurts? How about the frozen diet dinner commercials where the skinny woman sits down to her Styrofoam plate, fork to mouth, with a blissful look on her face? Statistically speaking, we’ve been subjected to thousands of these subliminal messages in our life time. But it’s all a fake !! Diet drinks and diet foods make you fatter, not thinner, and sicker, not healthier. Study after study after study proves this.